First Novels Club: In which THE GIRL OF FIRE AND THORNS takes over my life for a day. 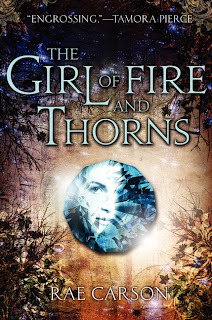 In which THE GIRL OF FIRE AND THORNS takes over my life for a day. You know those books that compel you to keep reading despite everything else you have going on in life? THE GIRL OF FIRE AND THORNS was like that for me. I mean, I started reading the NetGalley during lunch at work, and I ended up eating more slowly so that I could read more. And then I went home and pretended to accomplish normal things, like making dinner and doing dishes. And then I sat down at my computer, thinking I'd just read another chapter... and I didn't stop until I was finished, well past my bedtime. Prophesies are scary things. First of all, there's the whole self-fulfillment idea, and then there's the whole possibility of epic failure. Talk about pressure! Princess Elisa of Orovalle is the bearer of the Godstone. People start religions about her prophecy, which states that once in a century, God chooses a bearer (basically, a jewel appears in their belly button as an infant (not kidding)), and thus, they're destined to do something great. Vague and intimidating much? Personally, I love reading about the push-pull of a person wrestling with destiny, and how that struggle changes them. (Is that sadistic?) This prophecy is extra-troublesome because it's so vague that Elisa has absolutely no idea what her great act of service might be -- but it's revered enough that just possessing the Godstone puts her life in danger from people who might want to take it from (read: cut it out of) her. Eek! Lets get the much-talked-about thing out of the way: Elisa is an overweight princess. Though I was happy to see an overweight protag, I did get a little annoyed with her constantly hating on her body in the beginning. I found it very realistic, though, how her self-image affected her arranged marriage to King Alejandro of Joya d'Arena, the event that begins the novel. On the other hand, when (due to some dangerous adventures) she loses a bit of weight and becomes more fit, I was soooo happy to see that the girl still loved her food. I mean, she's a total foodie and appreciates a well-made meal, whether she's overweight or just delightfully curvy. Heck, yes. And there's so much more to her than her body type: she's witty, brave, intelligent, and much stronger than she often realizes. Throughout the book, her character transformation into a woman of conviction and action was awesome to read. Aside from that: I love love love Rae Carson's characters --- whether friend or enemy or frenemy, they're multifaceted and flawed and ever-changing, basically everything you hope and dream for characters to be. Even side characters surprised me delightfully with their depth and angles. I have to admit, I started reading the book and automatically pegged the characters, "Ok this one's the enemy, this one's the love interest, this one's the surrogate mother figure..." and I was wrong. Or right only for a short time. Halfway through the book, I stopped making assumptions. Loved it, believed it, and could totally picture it. The countries, traditions, religions, food, clothing -- it's my favorite kind of historical fantasy. I want to explore more of it! And the political conflicts felt very authentic and nuanced. Death: There's a solid amount of it. Some of it was expected (there's a war going on, after all), and some was totally shocking. Rae Carson didn't coddle Elisa. The Godstone is a dangerous thing to possess, so bad things happen to Elisa and those around her. On the upside, she becomes a total badass and a true hero via combating all that danger. It's awesome to witness the development, and it's a totally natural one, because she had a badass inside her from the get-go. And though the book starts out with things happening to Elisa, she quickly becomes a proactive heroine, which is excellent. 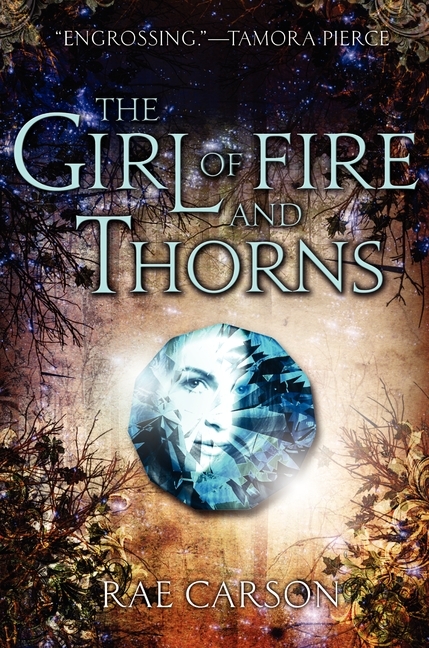 THE GIRL OF FIRE AND THORNS could easily be a stand-alone, which I just love. (No big cliffhanger!) But Carson set up the end so that we can see that Elisa will have plenty of trials ahead and that her life as a queen and Godstone-bearer will take many new twists and turns. And because she is made of awesome, I can't wait to see what adventures she embarks on next. You can fall in love, too! THE GIRL OF FIRE AND THORNS is available NOW!!! Have any of you already read it? What did you think? Leave a link to your review in the comments! I received my review copy from HarperCollins via NetGalley! *Trilogological is a word, right? It totally sounds like a real word. I can't wait to read this. My copy is on its way! Thanks for the great review.